DALLAS, Texas – March 20, 2018 – At the Oracle HCM World conference today, Evosys, a Global Oracle Cloud Premier Partner, announced its intent to acquire Massachusetts-based Newbury Taleo Group, a premier CEI certified Oracle Gold partner specializing in Oracle Cloud talent acquisition solutions. 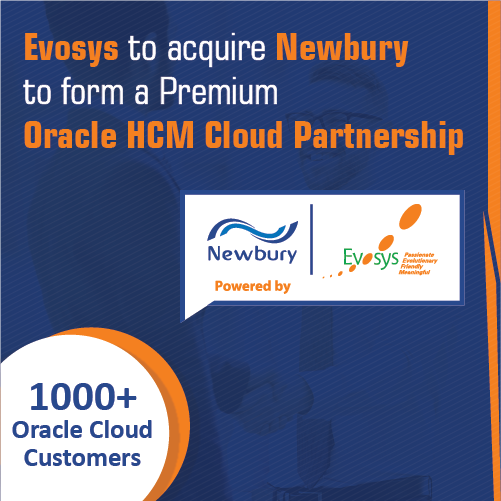 This strategic move will significantly boost Evosys’ North American presence and enable Newbury to immediately offer end-to-end Oracle Cloud HCM and ERP solutions to client organizations. Expected to close within the next 30 days, the merger will establish Evosys as one of the largest Oracle Cloud solutions providers, serving more than 950+ customers worldwide. Newbury Taleo Group is well-known across small business, major market, Healthcare and Higher Education sectors. The company has built a superior reputation for customer service, value-based pricing and unsurpassed delivery quality and support. We have helped hundreds of organizations optimize their use of Oracle talent acquisition solutions to recruit and on board the best talent at the lowest cost possible, said John Weston, CEO, Newbury Taleo Group. In merging with Evosys, we gain the opportunity to build one of the industry’s best Oracle Cloud HCM practices. Newbury Taleo Group will be rebranded “Newbury Cloud powered by Evosys.” The joint entity will deliver more industry-specific value propositions than any other global partner. Evosys and Newbury’s combined global strength and local presence will enable rapid, cost-effective Oracle Cloud solutions for customers across the Healthcare, Higher Education, Public Sector, Financial Services, Professional Services and other Commercial markets. Evosys is exhibiting this week at the Oracle HCM World conference. To learn more about the acquisition, stop by Kiosk HCM-16 or contact Mike King at mikek@evosysglobal.com. Evosys is a CEI certified Oracle Premier Cloud Partner with more than a decade of proven expertise in Oracle implementations. Recently named Oracle Global Cloud ERP Partner of the Year 2017, Evosys delivers cloud solutions across all product pillars, uniquely catering to the needs of a global market that demands high quality, cost effective solutions. The company employs more than 1200 professionals dedicated to Oracle Cloud delivery, sales and support, and serves more than 950+ customers worldwide. For more information, visit www.evosysglobal.com. Newbury Taleo Group is a premier, boutique CEI certified Oracle Gold partner specializing in Talent Acquisition solutions including recruiting, onboarding, learning and social sourcing. Founded in 2014, the company serves more than 630 customers in US and Canada. For more information, visit www.newburyconsulting.com.